Mother’s Day, I will reach the golden age of 72. My birthday doesn’t fall on Mother’s Day every year. 1942, the year I was born, my Mom was in labor the whole of 24 hours, hoping she would become a Mom on mother’s Day. She could ‘feel the adhesions in her belly snapping like rubber bands with each contraction,’ she said. Being the recalcitrant child I proved to be, I was born at 1 AM the day following Mother’s Day, a forceps baby I was told. Which means my Roman Catholic father, when asked if they should “save the child or the mother,” chose the mother. Thus, I came into the world black and blue and bleeding. Of course, every year on my birthday, the story of my painful (for Mom) birth was retold. For a long time, I felt personally responsible for my Mom’s poor health in the subsequent years (my childhood) which resulted in her early death when I was in my twenties. Being older and wiser with many years of therapy and counseling behind me, not to mention courses in Social Psychology, dozens of books, and 20 years in Al-Anon, I finally learned I didn’t cause it, I could not have prevented it although I was there, and I could not cure it. The past is a cancelled check, so Happy Birthday to Me. After I had blood drawn for the Celiac panel and annual physical next week, David drove me to the Fort Myers Exchange where a plant sale on behalf of Army Relief was in full swing. Cathy had told me on Sunday when she and Brother D stopped by that they had herbs. 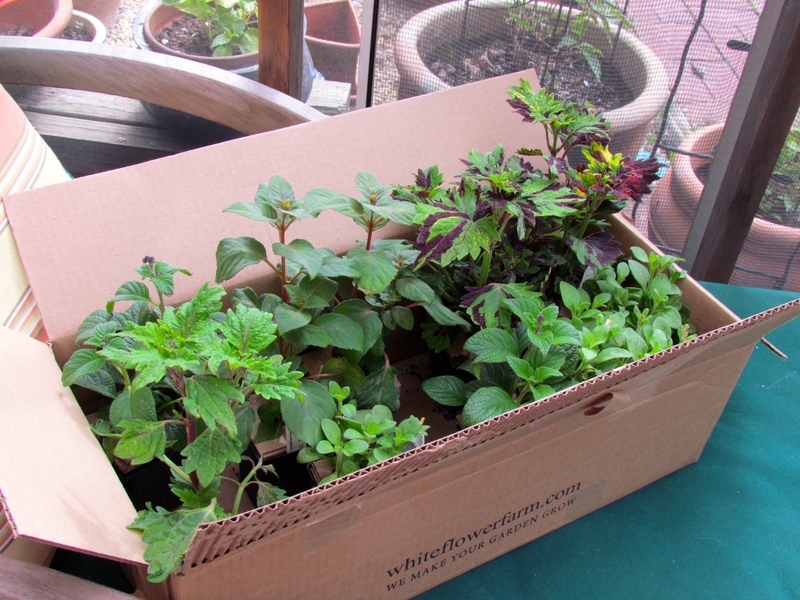 After the severe winter, I need to replant some of my herbs, especially the tender annuals. I found a great recipe in this month’s issue of Diabetic Living for a homemade Green Goddess salad dressing that calls for various herbs, including tarragon, which the Exchange did not carry, but assured me would arrive today. If they don’t have it, we will make the long trek out to Merrifield Nursery. I am determined to make the dressing with fresh ingredients. Fuchsia, Begonias,Petunias, Coleus, Oh My! 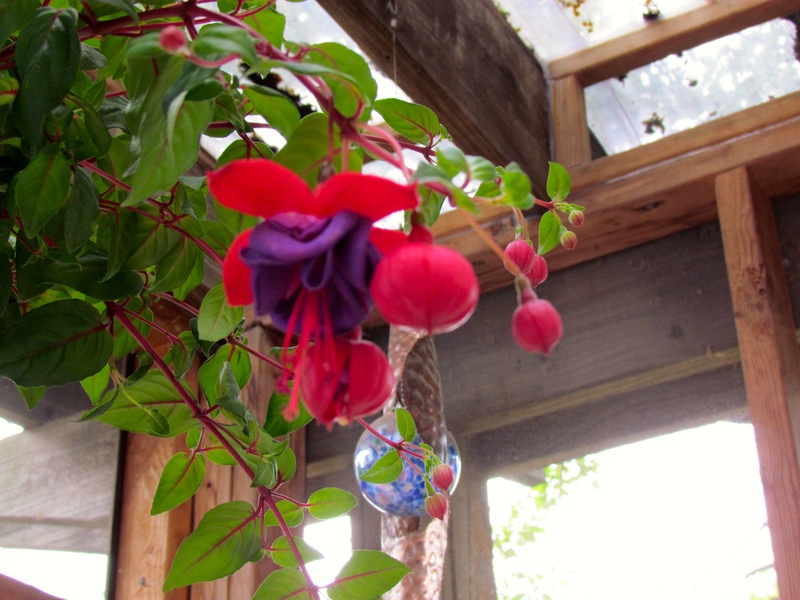 While we were at the post exchange, I spotted a beautiful hanging basket of Fuchsia. Anyone who knows me knows I am mad about Fuchsia. I have several new plants to set out in other pots, but wanted the instant gratification of seeing the blossoms…right now. This year, I am trying two new varieties of annuals, a Begonia (my second favorite flower) and a Fuchsia. The hybridizers in the Netherlands have been working like crazy to develop new plants, and I try a couple of the new ones each year. Just for fun. Below is a Fuchsia named Golden Gypsy. She isn’t much to look at now, but if I take care of her she promises to be a beauty. Stay tuned. This entry was posted in Cooking and Food, Family/Children, Gardening and Gardens, Health/Medical Stuff, Home/Home Improvement, Memories, Retirement Living, Sociology, Urban Spaces by SchmidleysScribblins. Bookmark the permalink. I am purposely bypassing the sad story surrounding your birth: it’s a good lesson in parenting in terms of the damage parents’ comments can make on young minds. On to happier subjects, I would love to see how the new varieties of fuscias and begonias look when they bloom. Please keep us posted. One of the most spectacular plants I’ve ever grown are the Dinner Plate Dahlias, which I ordered from Holland. They are spectacular. I am no fan of the dinner plate Dahlias, but love Dahlias. My problem lately has been an insect that loves them to death. 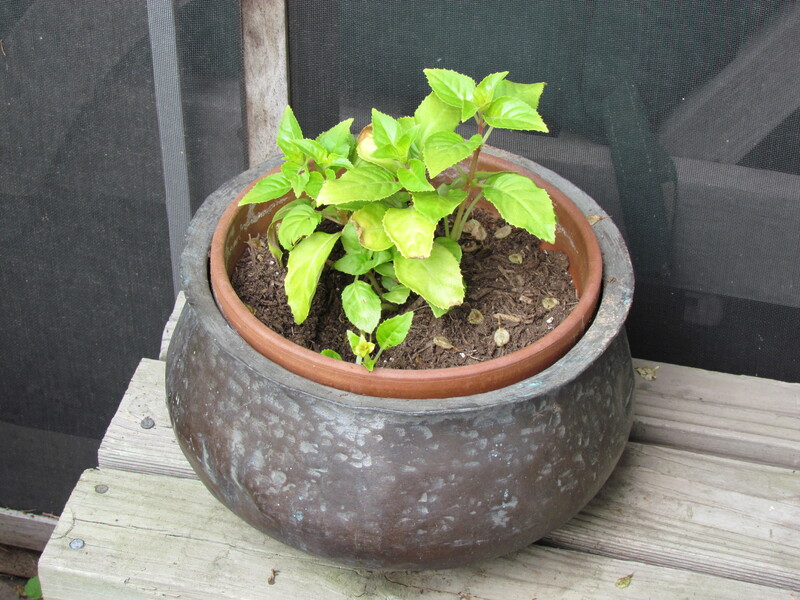 Trying one this year in a pot, but if those insects reappear, she’s toast. Hope you have a very Happy MD/BD this Sunday Dianne. I was born on Mother’s Day, 1961, though I didn’t find that out until I was an adult. My sister’s untimely death in 1967 changed my parents and damaged my childhood. I always felt my parents wished it had been me. Our journey sounds somewhat similar. I’m sorry you were made to feel that you caused your mother’s pain. But I’m glad you were able to work through it. And I wish you a very happy birthday! Gail, And Happy Birthday to you. My daughter was born in 1961. Happy Birthday Dianne! Glad you were able to overcome the guilt your parents inflicted on you. That’s sad you had to go through all that therapy but I’m glad it helped you move on. You are a strong lady! I would love the recipe too if you share it here. Your herbs and fuchsia look lovely. I need to start getting some nice plants around here. I don’t know that they inflicted guilt. I probably took it that way. Just as often Mom seemed to be telling me how badly she felt about the difficulty of bringing me into the world. Happy 72nd. Happy gardening. Happy culinary adventures. I admire that you continue to immerse yourself in learning, doing and enjoying. Thanks Linda. As you are a fellow stroke survivor, you understand the importance of living in the Now. Happy birthday! Aloha from Hawaii. As someone said, the past is immutable, so why go there? Move on. Good luck with your plants, Dianne. I wish you the best! Your posts are always thought provoking — I appreciate that a lot!! My backwards responses…yes, there are many things I wish I could say to both of my parents. Thanks would be at the top of the list, especially to my Dad and thanks to Mom for different reasons. Both of them gave me a keen awareness of the environment, Dad because he was a professional Naturalist (ecologist) and Mom because she understood gardening, farming etc. Thanks to them and my bird crazy grandparents, I learned to appreciate Nature as a child. Fort Meyers is the name of the US Army post that houses the men, horses, and paraphernalia for burials at Arlington Cemetery and the tombs of the unknowns. I’ve been on the post hundreds of times. I live four blocks from the back gate. When I was a military wife I used the facilities, and my youngest son attended kindergarten on the post. Thanks for the compliments about plants. They will appreciate it when I tell them another nature lover was admiring them. PS Today, my fried Ellen left with her RV to go camping over at Skyline Drive. Her husband died from a brain tumor last year, but she drove over on her own to meet friend for a rally. What? Mage is making pho? I wish I was there. I still haven’t found a place with good pho here in Hawaii. Dianne, I’m so sorry for what you had to suffer about your birth. My mom always told me how I gave her grief at my birth too. My daughter’s birth was difficult for me and I told her so. I’m going to have to talk to her about that so she doesn’t think I blame her for it in any way. What a shame that guilt was placed on you. That’s so unfair and cruel. I probably laid the blame on myself. However,children often get the wrong idea from something a grownup says. As you know from teaching kindergarten and/ or first grade. Our Mother’s day is usually in March and often coincides with my birthday. That will not happen again until 2024. May you live so long. Goodness,your parents must have fretted! You are having too much fun there. Seriously, if the dressing is good, might I please have the recipe. Thanks. Off to buy the stuff for Pho for the first time.